The MXL DX-2® is the world's first variable dual dynamic capsule microphone that allows you to fully customize your sound by mixing one capsule to the other and all points in between. The MXL DX-2® is the world's first variable dual dynamic capsule microphone that allows you to fully customize your sound by mixing one capsule to the other and all points in between. Capsule one's super cardioid large capsule design is tuned to capture the warmth and fullness of your instrument, while Capsule 2's smaller cardioid capsule offers superb mid-range and high end detail. The front of the mic is a flat-faced, side address design which places the capsules close to the source for optimal pickup, while the back side has the cross-fade knob, making adjustments a breeze. 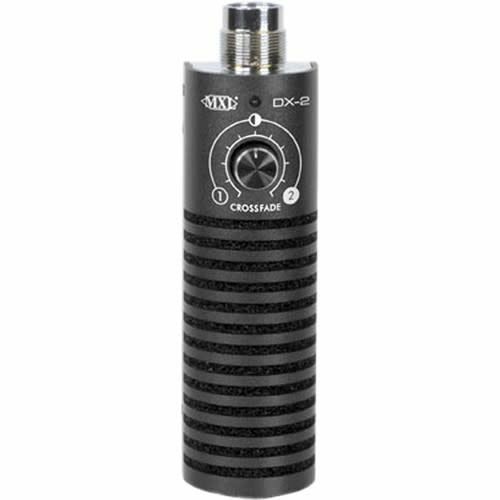 The patent pending DX-2 is the only mic that allows you to dial in your signature sound.